Is Britain Also Feeling the Bern? When bold populism gets a fair hearing, funny things start to happen. On Thursday, Bernie Sanders will travel to England for sold-out speaking engagements to boost Jeremy Corbyn, the Labour Party’s candidate for prime minister in the snap election scheduled for June 8. Corbyn is surging in British polls, and running a populist campaign that pledges radical economic reform. The 1992 victory of Bill Clinton’s New Democrats was echoed by the rise of Tony Blair’s New Labour four years later. The 2016 Brexit revolt against immigration and the European Union was followed five months later by Donald Trump’s stupefying victory in the US election. And the Sanders surge is now echoed by Jeremy Corbyn’s astonishing rise from the ashes in the British election. Could Labour’s Corbyn Actually Win the British Elections? The Martian’s Guide to British Politics, or: Is There Intelligent Life on This Island? In April, with the Labour Party imploding, Tory Prime Minister Theresa May called a snap election because she was certain the Tories would expand their majority in Parliament. Early polls showed her beating Corbyn by 21 percentage points or more. 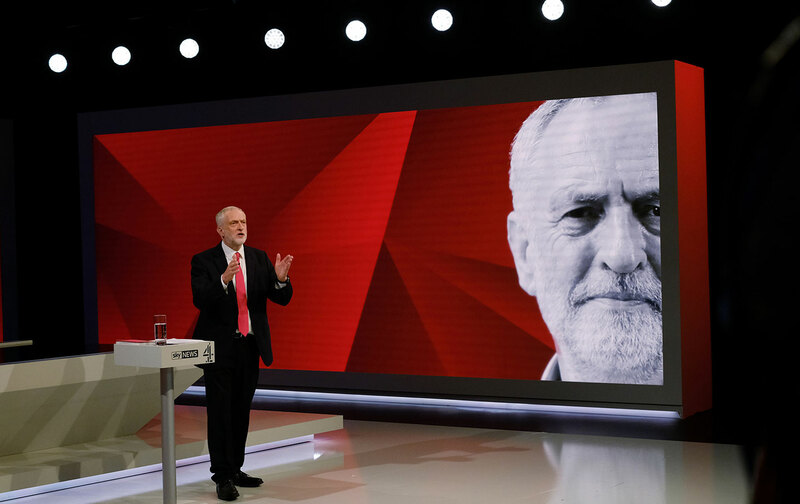 Corbyn was ridiculed in the press, reviled by Labour’s Blairites, and deemed a potential “disaster” as prime minister by over half of British voters in a May poll. As a leader of a party whose establishment loathed him, Corbyn floundered. May, in haunting echo of the Hillary Clinton campaign, made character the centerpiece of her campaign, parading herself as “strong and stable” in contrast to the radical incompetence of her opponent. Then the 2017 Labour Party Manifesto, “For the Many, Not the Few,” leaked to the press. A full throated, 24,000-word populist agenda, it was mocked as a “suicide note” by The Economist. The manifesto pledged to provide the equivalent of an economic bill of rights to guarantee basic security for workers—from education to housing to retirement security. It also outlined a plan to nationalize key utilities, thereby reversing the privatizations that have been driving up costs. Corbyn’s plan would hike the minimum wage to the equivalent of $15 an hour, prohibit on-call employment contracts, ban unpaid internships, and bolster the ability of unions to organize. Labour also pledged to build public housing, make university tuition free, provide free childcare for children over 2, invest billions into improving public schools, and serve free school meals for every child in primary school. Pensions would be guaranteed, the National Health Care Service would be bolstered, and welfare cuts reversed. In contrast, the “strong and stable” Theresa May appeared to be anything but. When her call for cuts to pension guarantees and old-age care—what became known as the “dementia tax”—came under attack, she disavowed it. She refused to debate Corbyn when she was up in the polls, and then ducked him when he began to close in the polls. Even the conservative tabloids turned critical. Polls showed Corbyn surging, reducing May’s lead to single digits. The value of the pound sterling got shaky. Elite commentary grew hysterical. This week, an extensive YouGov poll of 50,000 voters suggested that the Tories could lose their majority in Parliament, forcing a coalition government. With the collapse of the Labor Party in Scotland and right-wing UKIP voters folding into the Tories, it is virtually impossible for Labour to win a majority in the parliament. But Corbyn’s surge, like Sanders in the United States, is testament to the power of a bold populist alternative. For decades, the Thatcher proclamation—that “there is no alternative” to neoliberal globalization—has been conventional wisdom among Tories, Liberals, and New Labor in Britain, and Republicans and New Democrats in the United States. As inequality grew and the middle class struggled to stay afloat, those displaced were essentially written off. What Corbyn and Sanders’s surge—and the victory of Donald Trump on the right—demonstrate is that people in large numbers are looking for and open to bold alternatives, even ones that challenge the shibboleths about big government and the genius of markets. The lesson should not be lost on Democrats. It isn’t enough to resist Trump’s excesses or expose the cruelties of his policies. Voters are looking for a bold new course and leaders with the integrity to champion it against the entrenched interests and big money. Sanders’s surge was propelled by his call for fundamental reform. Corbyn’s populist manifesto was his invitation to the dance. In the United States, similarly robust policies are suddenly everywhere: a $15 minimum wage, Medicare for All, a green-jobs agenda, fair and balanced trade, tuition-free college, progressive tax reform, and a job guarantee. That agenda begins to offer people a choice. It won’t be easy to overcome the scorn of the establishment and the timidity of the political class. But on both sides of the Atlantic, when radical social reconstruction gets a hearing, it finds an increasingly receptive audience.